The word menisci are derived from the Greek work meniskos, which means "crescent". At knee joint the menisci plays a major role in congurency of the joint. Menisci forms the concavity in which the femoral condyles sits. Menisci rests between the thigh bone femur and the tibia and there are two knee joint ligaments. 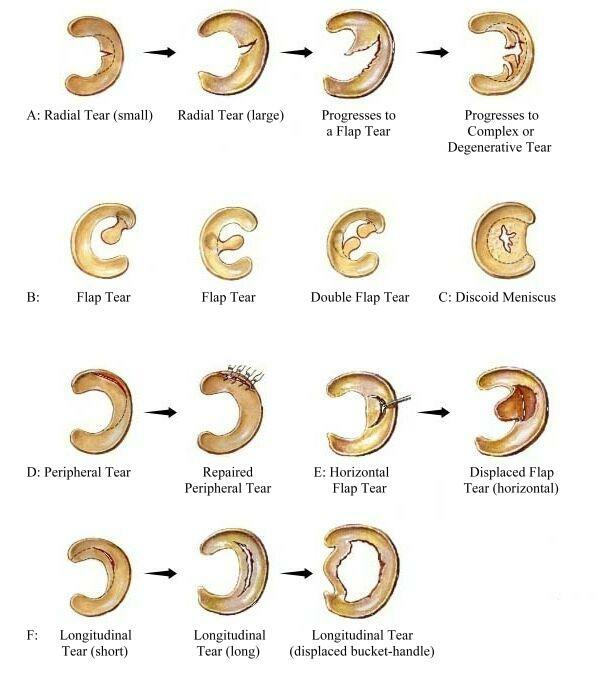 They are a type of cartilage in the joint. The rubbery texture of the menisci is due to their fibrocartilagenous structure. Their shape is maintained by the collagens within them. One meniscus is on the inner side of your knee--the medial meniscus. The other meniscus is on the outer side of your knee--the lateral meniscus. The medial meniscus is approximately 1.4 in (3.5cm) in length. The anterior horn of the medial meniscus is attached to the anterior surface of the tibia well off the tibial plateau. 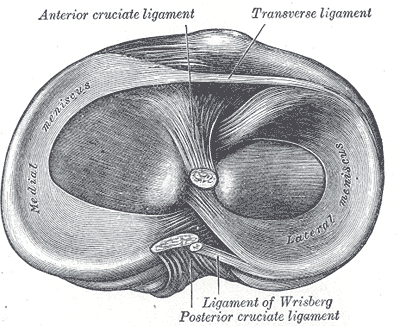 The anterior fibers of the anterior cruciate attachment merge with the transverse ligament, which connects the anterior horns of the medial. The posterior horn of the medial meniscus is firmly attached to the posterior aspect of the periphery to the joint capsule. At its midpoint, the meniscus is firmly attached to the femur and tibia through a condensation in the joint capsule known as the deep medial ligament. The medial meniscus has no direct attachment to any muscle, but indirect capsule connections to the semimembranosus may provide some retraction of the posterior horn. Medial menisci are C shaped wedge fibrocartilagenous structure located between condyle of femur and tibia. It is somewhat more in C shape as compared to lateral menisci as it is medial meniscus are clear of the plateau anteriorly and posteriorly. Anteriorly, it is also attached to lateral menisci by transverse ligament and patella either directly or by patellomeniscal ligaments which are anterior capsular thickenings. Its anterior portion is much narrower than the posterior portion and the narrower portion is less prone to injury also. The vascular supply of the menisci originates predominately from the inferior and superior lateral and medial genicular arteries. During the first year of life the meniscus contains blood vessels throughout its body but when the weight bearing starts the vascularity and the circulatory network diminish and only 25-33% area remain vascular by the capillaries of the capsule and synovial membrane. The vascularity diminishes so much that in 4th decade of life only the periphery is vascular whereas the center of the menisci is avascular. The center portion is completely dependent upon the synovial fluid diffusion for nutrition. The central avascular portion of menisci either does not heal completely or heal at all after injury. Meniscus injuries commonly occur in contact sports; often in combination with ligament injuries, particularly when the medial meniscus is involved. This is partly because the medial meniscus is attached to the medial collateral ligament, and partly because tackles are often directed towards the lateral side of the knee, causing external rotation of the tibia. Injury to the medial meniscus is about 5 times more common than injury to the lateral meniscus. In cases of external rotation of the foot and lower leg in relation to the femur, the medial meniscus is most vulnerable. A varus force applied to the flexed knee when the foot is planted and the femur rotated internally can result in a tear of the medial meniscus. The patient comes up with major complain of knee pain, swelling and knee locking which is when the patient is unable to straighten the leg fully. This can be accompanied by a clicking feeling. Weakened or hypotrophied quadriceps muscle. ↑ Tuxoe JI, Teir M, Winge S, et al. : The medial patellofemoral ligament: A dissection study. Knee Surg Sports Traumatol Arthrosc 10:138–140, 2002. ↑ 2.0 2.1 2.2 Gray JC: Neural and vascular anatomy of the menisci of the human knee. J Orthop Sports Phys Ther 29:23–30, 1999. ↑ 6.0 6.1 Peterson,Renström. SPORTS INJURIES:Their Prevention and Treatment.Third Edition. ↑ Brunker,Khan.Clinical Sports Medicine.3rd Edition.